It is well known that the benefits of using monkey bars are improved grip, increased core and upper body strength and cardiovascular endurance. All of this can now be achieved in a unique and motivating experience through using the Monkey Mill. 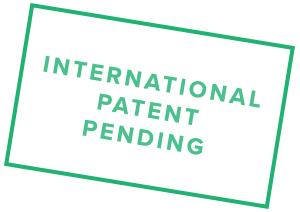 Monkey Mill is a patent pending, innovative motorised monkey bar machine, providing a unique mix of cardiovascular and strength conditioning for users of all levels of ability. The continuous moving bar system provides an endless run of monkey bars in a small footprint in any training space. Monkey Mill comes with the added functionality of varying speed settings, interval programs and heads-up display showing live exercise information. 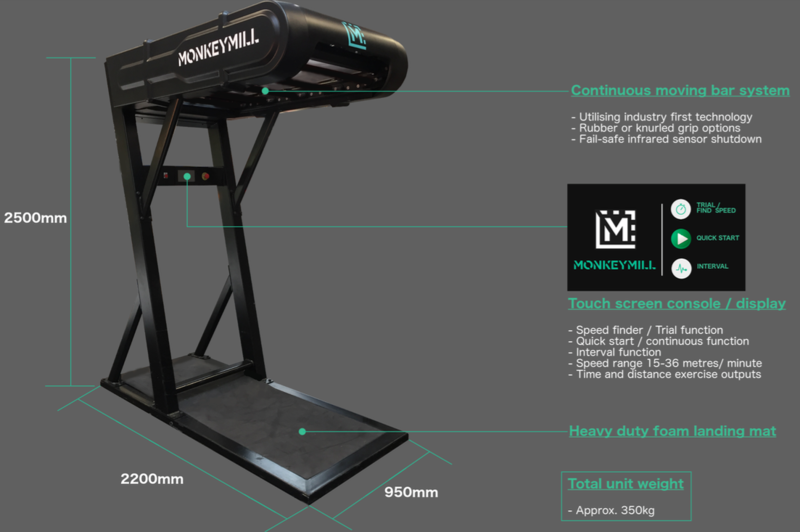 Disrupting the rows of treadmills and cross-trainers, Monkey Mill will be a striking addition to any gym floor, designed to provide an effective and motivating training experience. Speed adjustments can be made through this console ranging from 15m/min to 36m/min. Interval function. An infrared safety sensor is positioned towards the rear of the mechanism. Whether it is used as part of a circuit training session or added into the end of a weights session, Monkey Mill provides a total workout like no other machine. With correct guidance and continued use within a training regime, Monkey Mill can be used as a tool for progressively building upper body and grip strength, starting with simply hanging onto a bar, and moving onto successfully swinging from bar to bar on a low speed setting. For those who have mastered the monkey bar technique, Monkey Mill is a perfect tool for improving core and upper body strength, grip, and cardiovascular performance. Performing this exercise at any speed setting puts the whole body into action and even the shortest 20 second burst on the mill will have the heart racing and the muscles pumped. 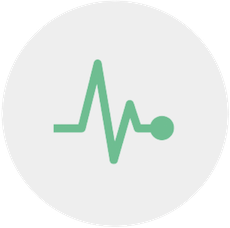 Finding a rhythm is the key to performing this exercise successfully and getting the most effective results. The core must be engaged and it works hard throughout the exercise to control the natural lateral swing of the body. For those looking to push and extend their boundaries in strength and cardiovascular conditioning in a way that simply isn’t possible on any other machine, Monkey Mill comes into its own as a real goal setter and endurance tester. The speed can be set as high as 30m/min and distance or time goals can be set and extended using the heads-up display. The biceps are worked in a similar way to the latimus dorsi. They are acting as an agonist during the lifting phase of each swing. The deltoids are worked in a unique way. They are extended, whilst contracting and are working eccentrically to stabilise the movement. The core is engaged throughout the exercise. It is working hard to control the swing and stabilise the movement. Huge emphasis is put on the forearms which are working hard during each swing to support the user’s body weight with only one hand on the bar. The use of the latissimus dorsi is key. They act as an agonist as the user lifts themselves up during each swing. They also assist with stabilising the movement. “So what are the benefits of incorporating the Monkey Bars into your training programme? Well, ask anyone that’s tried it!